Earlier this spring a six-foot diameter space in the front yard was left bare after removing a badly sited Chinese Elm. A few weeks ago the little area was planted with a mix of perennials and annuals. Providing some immediate color were seven of the annual Angelonia angustifolia ‘Angelface Blue’ (Summer Snapdragon), along with a richly colored perennial, Gaura Belleza (™) ‘Dark Pink’ (Butterfly Gaura). 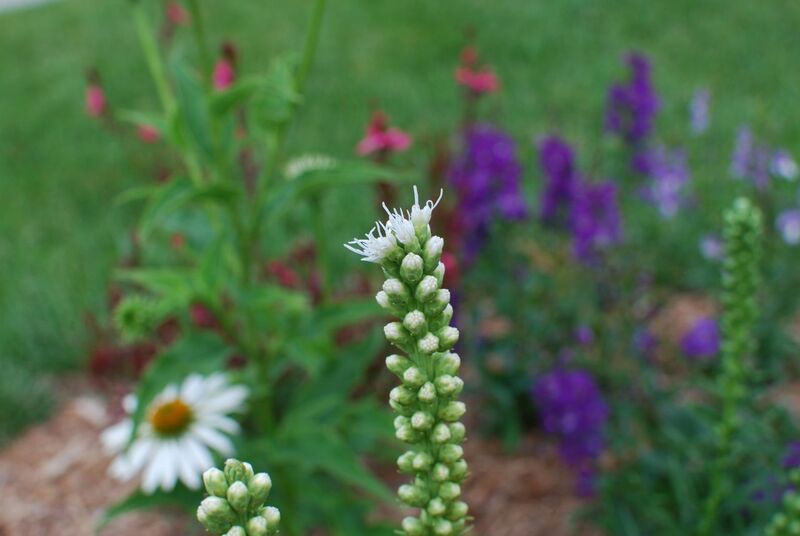 Now the other perennials are beginning to bloom, Liatris spicata ‘Floristan Weiss’ (Gayfeather) and Echinacea purpurea ‘White Swan’ (Coneflower). This spring bees have found many plants to their liking and the Liatris is proving popular too. 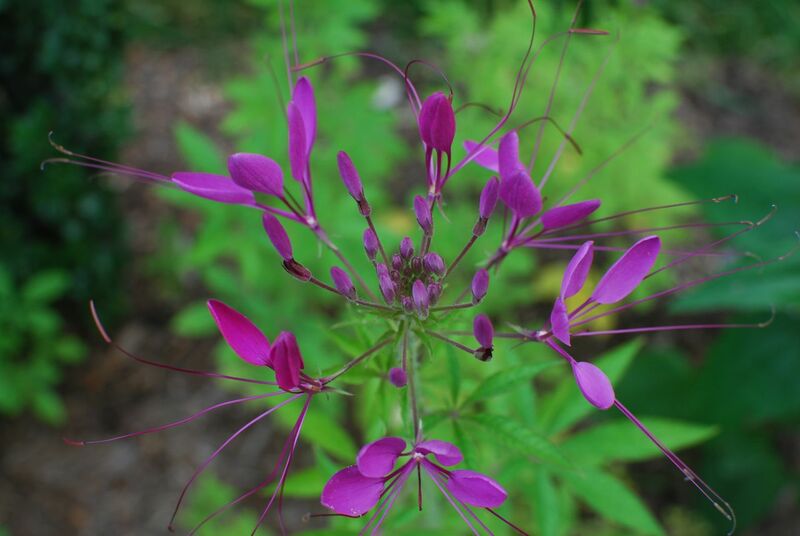 Cleome (Spider Flower) volunteers in this garden every year and has just begun flowering this week along the southern side path. 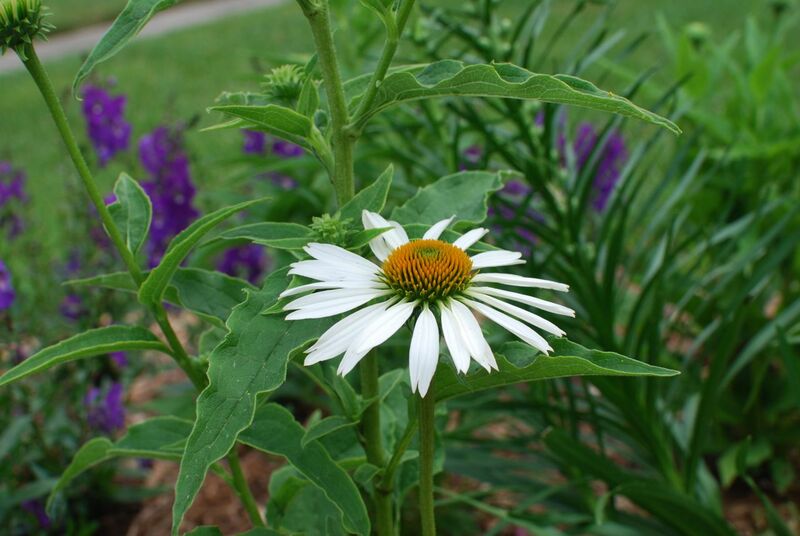 It originated from seeds purchased by a friend at Thomas Jefferson’s Monticello. She passed some along to me more than a decade ago. Recently I transplanted a few of the volunteers to other areas of the garden. Gladiolus is an old-fashioned flower that I read recently is enjoying a bit of a revival. 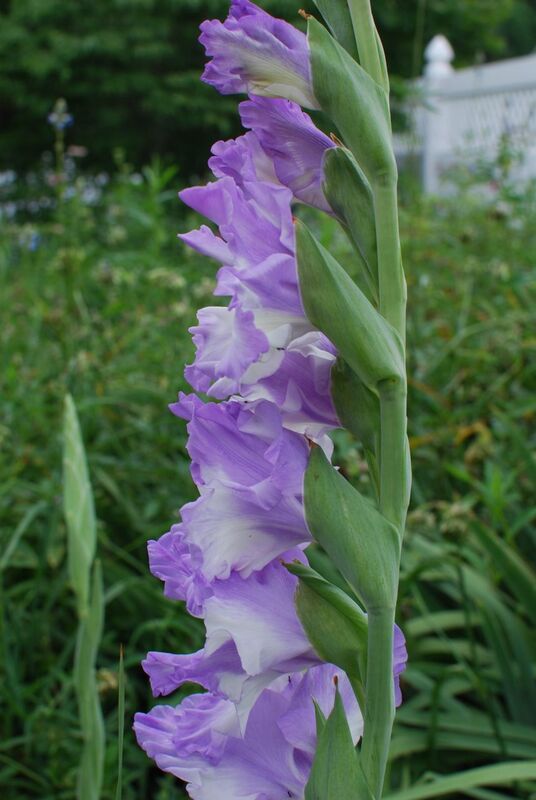 I have always had a few gladioli in my gardens, although my favorite deep dark purple ones died out several years ago. A steady rain fell this morning until eleven. Skies became blue with plenty of white fluffy clouds for the rest of the day, but the temperature remained cooler than usual for this time of year. A brief excursion to the North Carolina Botanical Garden proved interesting and helpful. I was able to identify my pink yarrow in the southern bed as Achillea filipendulina (Fern-leaf Yarrow). Also a very friendly staff member was digging up and trimming back Tradescantia, a task I have spent many hours doing in my garden, so we fell into a discussion about how to deal with it. She demonstrated for me her technique for digging it out so as to get as much root as possible (using a sideways twist). In the end we agreed it can also just be cut back to enjoy again in September. This entry was posted in garden and tagged angelonia, cleome, echinacea, gladiolus, liatris, nature photography, photographing nature, photography, plants on June 7, 2012 by pbmgarden. Thanks for your comments Cathy! 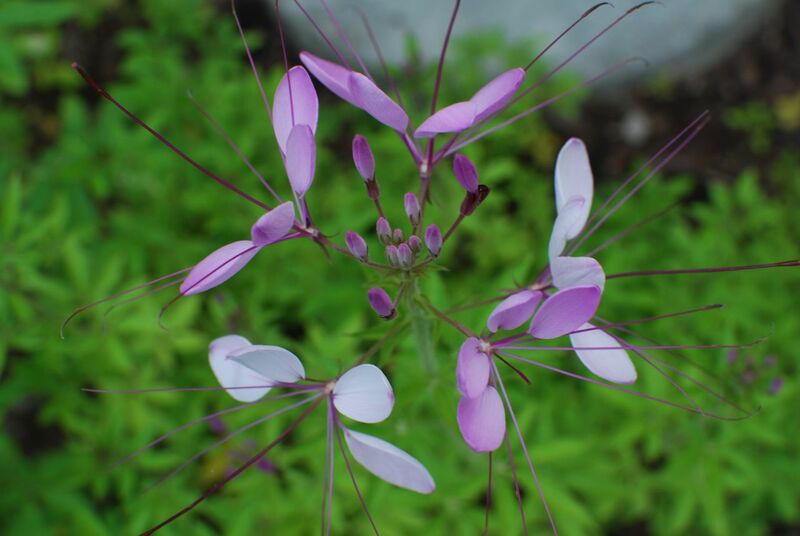 It’s shame about your cleome–dealing with pests is frustrating. 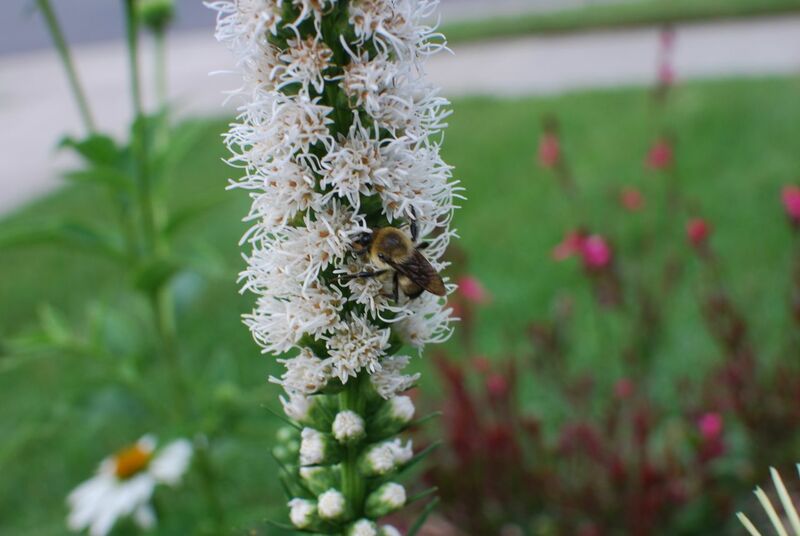 Glad you are enjoying the Liatris. I first grew it several years ago in a section of the garden where all the foliage was looking way too similar. The shape of Liatris and its height (3-4 ft) helped add some variety and interest. Thanks so much. A friend offered to let me try out her camera this week (much more complex than what I’m used to, but fun). 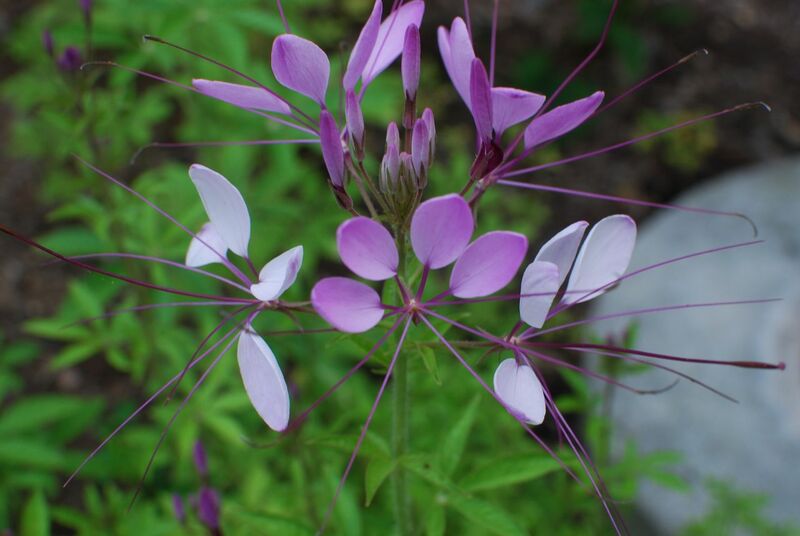 Seldom do I see Cleome hassleriana used in other gardens around here, but it is one of my favorites. I agree with you about the color. I have seen it in white, which is nice too. Eventually it reaches almost 5 ft tall (150 cm) which I find useful. Good luck with your new area–hope you’ll post pictures. You have some lovely plants. The Liatris is different to the one we grow which is pink.I do not know Angelonia, the Summer Snapdragon. I must look it up in the RHS book. Thank you. 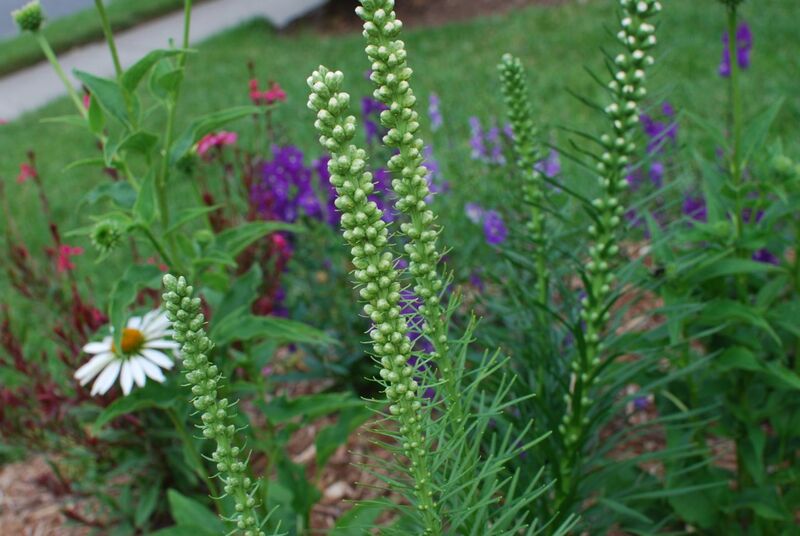 Liatris spicata is a US native, more commonly it is a purplish pink. What does yours look like? I tried Angelonia for the first time last year and became a huge fan, as it bloomed and bloomed into October without any maintenance. Lovin’ your pics. I never could get much out of liatris. Oh, well. I hope you are having as much fun as I am. Oh yes, it’s fun here. Thanks very much for your comments. So far the liatris in these pictures is doing ok, but in another area they’re not as upright as I’d like.